BLOOMFIELD HILLS, Mich., April 1, 2013 /PRNewswire/ -- Millennials continue to show a strong interest in purchasing a home, according to the PulteGroup Home Index Survey (PGHI) by national homebuilder PulteGroup, Inc. (NYSE: PHM). For renters ages 18-34 with an income of more than $50,000, 65 percent indicated their intention to buy has significantly or somewhat increased in the past year. Additionally, the vast majority of millennials aren't moving into their first home on their own. Millennials plan to be coupled in their home with 76 percent indicating they will live with a spouse or significant other, and of those not moving in with a significant other, 22 percent anticipate having a roommate, including a friend, parent, in-law, grandparent or sibling living with them. "Millennials have witnessed the housing boom and bust, but still believe home ownership is a good investment," said Fred Ehle , vice president for PulteGroup. "Consistent with other third-party research that shows more than 90 percent of millennials plan to buy a home someday, we see a lot of young adults who are making financial sacrifices to afford a place of their own. With the combination of incredibly low mortgage rates, rising rental rates, and very low inventory levels, millennials realize now is a good time to purchase a home." In 2012, PulteGroup sold just over 19,000 homes of which approximately 30 percent were first-time homebuyers, many of whom are part of this large demographic. In the company's internal buyer surveys, more than 50 percent of millennials reported that the desire to own/build equity was the primary reason for purchasing their new home. The second largest reason, at 12 percent, was that millennials were tired of apartment living. Tiffany Troyer , a 25-year-old who recently signed to build a new house in Austin, Texas, is one millennial taking advantage of the improved housing environment. "I've always wanted to live in a house that I could call my own," said Ms. Troyer, who is an area director for Nitro Swimming. "Since graduating from Baylor University in 2009, I have been paying rent on an apartment. I was so frustrated with the rising cost of apartment rates, and when I talked with my parents about the benefits of home ownership, it just seemed like the right time to take advantage of the low mortgage rates and move in to a new home where I could personalize the space and not worry about unexpected repairs or renovation projects. To say that I'm anxious to invest in something that can contribute to my future is an understatement." According to Mr. Ehle, "Millennials today want a lot of value in their home that makes efficient use of every space. 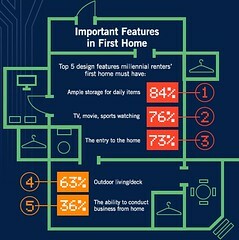 In fact, the single most important home feature to a millennial buyer today is the floor plan layout." Not surprising then is that 69 percent of millennials overwhelmingly want an open/layout space in the kitchen and family rooms for entertaining family and friends. The Internet is the primary source of information for home shoppers today with more than 90 percent researching via the Internet during their home search. When seeking personal advice about purchasing a home, the PGHI survey revealed that the plugged-in millennial will not only log onto the Internet, but they will also reach out to both real estate professionals and their own parents. "Millennials really do their homework and use several resources to make this important decision. That's why there are a variety of ways millennials can get information about a home on our branded web sites. From mobile apps to chat rooms to visiting our model homes and designing homes online, PulteGroup provides a variety of ways for millennials to get the information they want, when they want and any way they want," Ehle said. The PulteGroup Home Index (PGHI) survey polled 521 U.S. adult renters ages 18-34 to better understand millennials' interest and sentiment toward purchasing a home. The survey was conducted online by Russell Research from January 18–21, 2013. At a 95 percent confidence level, the results have a statistical precision of +/- 4.3 percentage points of what they would be if the entire adult population had been polled with complete accuracy. Figures for gender, age and geography were weighted where necessary to match their actual proportions in the population. Great find, Peter, and thanks for sharing. It seems that there is a lot of information surfacing that validates the buying habits and needs of this rising generation. There is some interesting finds in this article are that Millennials are looking for an efficient, open floor plan and ample storage space. These issues came up at the charrette.